This project is on hiatus until we get the volume 4 raws in Japanese! Hence begins the story of a slave to an empress of the greatest empire of all time – Alexandra, the woman who would one day be known as Roxelana, Empress of the Ottoman Empire. Just leaving a comment to say that I LOVE this manga series and thank you thank you thank you sooo much for scanlating this!! hi, just wondering if you’ve found volume 3? 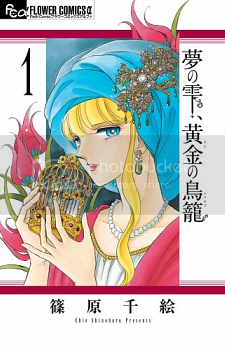 :) i’m so itching for this manga…. thanks for scanning this hope it becomes active again soon. Thanks for everything you have done so far! Aww I miss DoD so much… a true masterpiece for sure. Hey! I love this ^^ Do you guys have any idea of when it will be uploaded? Thanks! Ever read a manga and feel sad when it finishes? That’s what I felt when I finished reading Red River. It was so good I didn’t want it to end! I finaly think I’ve found another manga that might be just as good. Thank you so much for scanlating Drop of Dreams! I’ll patiently wait for the next chapter no matter how excruciating! I reeeaally hope this won’t get dropped and will become active soon! I have read Anatolia Story again and again. Really love Shinohara Chie’s work. She is so obviously fascinated with the old Middle East history. And the drawing is superb too. Drop of Dreams has also been wonderful so far. I love strong heroine, and Alexandra is quite an intelligent girl who is always eager to learn. Thank you for picking up this series and I hope you guys will be able to continue it soon. I hope you guys have found the raws/will find them soon. I love this manga and so excited to see how the rest goes. The quality isn’t that good but they have up to volume 3. I surf the net and find out vol 3 (takoubon) has just been published in Japan on December 2012. Hope to see this project active soon. She should be pragnent now. At least if she goes by some historical facts her first son is born in 1521 and if he is on a half a year compain she must already be pragnent. Things will get really interesting now. Raws for chapters 9 to 11 can be found at http://aphroditemangaland.blogspot.com/2012/05/yume-no-shizuku-ougon-no-torikago.html. It was posted in 2012 but the links are still alive. Scans are good too, save some excess wording on certain pages of chapter ten. It is level with barely any blurs. Hope that helps. I’m really excited for the translation after seeing the raws. Best of luck. I started reading this recently and i really love it. Thank you guys very much for translating and i can’t wait for the next chapter > <. Hope you guys will be able to get the raw soon! I wish I can see volume 4 soon! Thank you so much for doing this project! I’m glad to read that you will continue translating this. Thanks so much!!! I will wait FORVEVER for you guys!!! Fighting!!! I’m really glad this is being updated! I’ve waited so long. ;w; Thank you for continuing this series’ translations. I seriously hope you continue this project, I really enjoy reading this work!! Thank you for all your hard work so far!